Ah, Facebook.... you fickle brat. If you are a blogger or business owner you likely already know how difficult Facebook pages can be with their all too often updates that make it even harder for your fans to see what you post. So today, I'm going to give you some tips that despite any updates and changes, should still help you grow your Facebook. When people comment on your posts, make sure you respond to them and don't just do so by liking what they said. Respond with a full sentence or two and tag them in the response. This makes them feel appreciated, noticed, and they are more likely to respond next time as well. Whenever you post a photo or share a link to a blog post, make sure to include a call to action at the end. Make it something that requires people that see the post to answer a question like "Which of these is your favorite way to use vinegar around the house?" or ask them to "LIKE" if they agree and if not, leave a comment as to why they disagree. The good ol' Facebook algorithm makes it so that if people are engaging and interacting on your posts, you'll be showing up more in their feed. If you post a really pretty graphic or very informative post and ask your fans to share it, make sure there's a part in the original post or on the image that makes a note to follow your page for similar content. This way when people see these shared posts and think "Wow I love this type of information", they can see where they can get more. So there are lots of tools that show you how much engagement each post of yours gets. Take advantage of that and look for a pattern where your engagement is higher and what day of the week and time of the day it is. Then make sure you schedule future posts for around that same time. Remember that your readers may be in different time zones as well so posting something at 5 am Eastern time is definitely not going to be seen right away by the West Coast because they're asleep. It's nice for your fans and readers to see the personal side of you, not just the business side. So in between the promotions of your brand, be sure to give them a glimpse of your life. Share a newly redecorated room from your home, a glimpse of what you are up to over the weekend, and even a photo of you with your family and pets. This makes everything about you more relatable. Facebook does offer paid advertising where you can pay a fee and they promote your post to get even more views, engagement, etc. Try to do this once a month at least. It's a great investment and you get to see a full breakdown of the results afterwards. You can specify the specific demographics of the people you want to engage, the location, and even what other people in your field do that gets good results. And if you're not doing so good along the way, Facebook messages you with tips on how to improve the results. So hopefully with a few of these tips you'll see your likes go up and your engagement increase! Good luck! 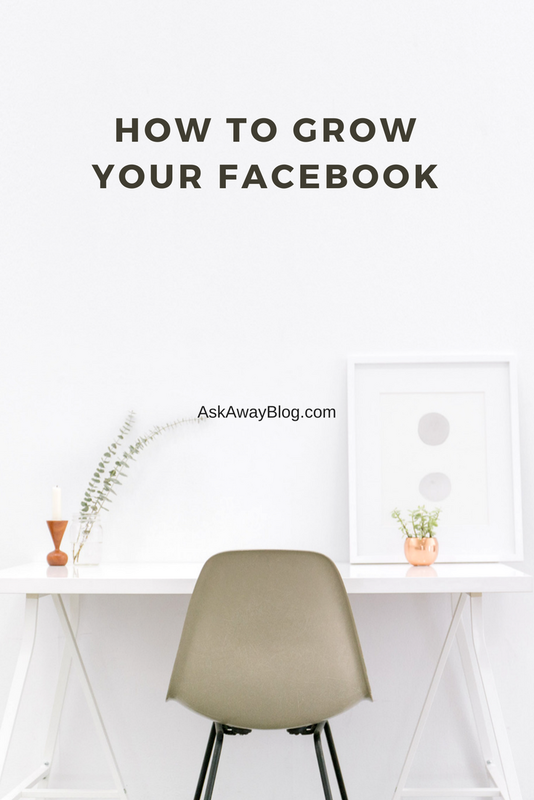 Do you have any tips for growing your Facebook? ?